We are a Supplier, Exporter and Importer of various tools including Nile Air Fil Saws. These are highly demanded nowadays. It has many features like it is handy, easy to use, made from high quality of steel etc. Our quality team tests these saws against highest standards and parameters of quality set by industry to ensure we keep on providing the immaculate quality we are renowned for. These are available at very competitive price. Light in weight and silent in operation. Lubricant inlet is set for easy lubrication. Easy to adjust air flow. No play between head and holder for minimum vibration. 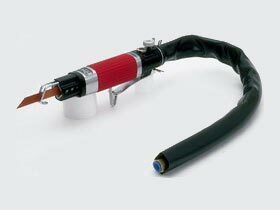 Soft air hose is used for comfortable operation. Higher cutting and finishing efficiency is assured. Steel straight cut type (AF1032). 2 pieces. Steel circle cut type (R1032). 1 piece. Flat type (AFF50). 1 piece. Steel straight cut type (AF1032). 10 pieces. Steel circle cut type (R1032). 10 pieces. Steel small-circle cut type (SR1036). 10 pieces. Urethane bumper cut type (R1010). 10 pieces. Timber Aluminium cut type(W1014). 10 pieces.